This sausage stuffing will be the perfect addition your next chicken dinner or a Thanksgiving treat. 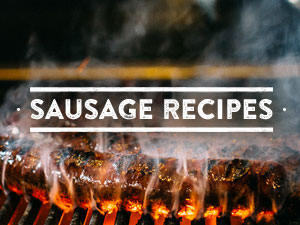 Try it with our Butcher Brat or Smoked Spice Wurst sausages. Serves 4-6. Heat the butter in a large skillet over medium heat. Add the sausage and fry until browned. Add the onion, celery and garlic. Continue cooking, stirring until the vegetables are softened, about 5 minutes. In a large mixing bowl, toss the bread cubes with the herbs and seasonings. Add the sausage, vegetables and lemon zest. Stir in the chicken broth until well moistened, but not mushy. Pack into a baking dish and cover tightly with foil. Bake at 350 degrees for 25 minutes. Remove foil and broil for 4 minutes, or until browned on top. Be a part of our community. Sign-up for our e-newsletter and be first to know about Butcher & the Boar happenings and special events.